By Mark Smesko, Mike Vallas | August 3, 2016 at 8:22a.m. Where: Donavito’s Restaurant & Catering Co. Kitchen hours: Monday, 11 a.m. to 9 p.m.; Tuesday through Saturday, 11 a.m. to 10 p.m.; and Sunday, noon to 8 p.m. during football season. Nothing is quite as tasty as a good secret. Sometimes savory, maybe sweet, oftentimes salty or a bit sour. A secret can be kept like a hidden gem just for you to enjoy, or maybe to protect someone else’s confidence. In any case, we all have them. Of course, when you are trying to write a story, sometimes a secret may pose a problem. Well, for lesser men that might pose a problem. It’s been a while since we’ve been to Struthers for a feature. This trip took us down to Donavito’s Restaurant & Catering Co. on South Bridge Street. We met up with owner and executive chef Alan Donatelli, his wife Bridgette, and BJ Sulka, executive chef and general manager. A window table with street view afforded us a chance to reminisce: Mark about his college days at the Wagon Wheel, and Mike about waiting in the car with his grandmother at the entrance to Sheet & Tube to pick up his grandfather. Our initial discussion with Chef Donatelli was replete with stories about his own ties to the local community. Chef Donatelli has been in the restaurant business for 32 years, with ties that go back to the wet burrito days of the Park Inn. Chef Sulka was part of the Boathouse kitchen way back when. Mark has stories about his adventures at both places that he’d rather not be printed in a public forum. Donavito’s has been a part of the Struthers landscape for 14 years. Donatelli emphasized “We are a family oriented business” and credits the support from the local community as the foundation of his restaurant. He is building upon that base through a rapidly expanding catering business. Tonight we had the opportunity to sample some of Donavito’s standout dishes. Our meal began with an appetizer off the specials menu, the John Reese Calamari. This dish was big on flavor and consisted of fried calamari dressed with a sweet Thai chili sauce, house made hot peppers and Italian greens. The calamari was lightly breaded and paired well with the tender greens. The peppers provided heat that was balanced nicely by the sweet chili sauce. A very tasty starter. Our meal continued with one of Chef Donatelli’s signature sandwiches, the Cherry-Smoked Reuben. This starts in the usual way with the chef making the corned beef in-house. The twist comes when he smokes the beef low and slow for 15 hours. When you first take a bite, you get the usual flavors — tartness of the kraut, slight sweetness of the Thousand Island dressing and the crunch of the toasted rye bread. The thing that makes this sandwich so delicious is the smoke flavor of the beef. This adds another layer of flavor that makes this easily one of the best Reubens we’ve ever had. This sandwich is not on the regular menu. Follow Donavito’s on social media and when it’s available, do yourself a favor and go get one ... or two. Next up was a parade of entrees that began with their Signature “lasagna style” eggplant parmigiana. Layers of baked eggplant, tomato sauce, ricotta and Romano cheeses are stacked high and served with an edible garnish of lettuce and shredded red cabbage and carrots. This dish reminded Mark of his childhood and the eggplant parm his own mother used to make. Tender eggplant, rich savory tomato sauce and creamy, slightly salty cheeses. A wonderful, comforting plate. Next we sampled one of their popular pasta dishes, Tortellini ’n Pink. The cheese stuffed pasta is served with a slightly spicy pink alfredo sauce. We tried to get details on the sauce but like many of the questions on ingredients and technique, it was a house secret. 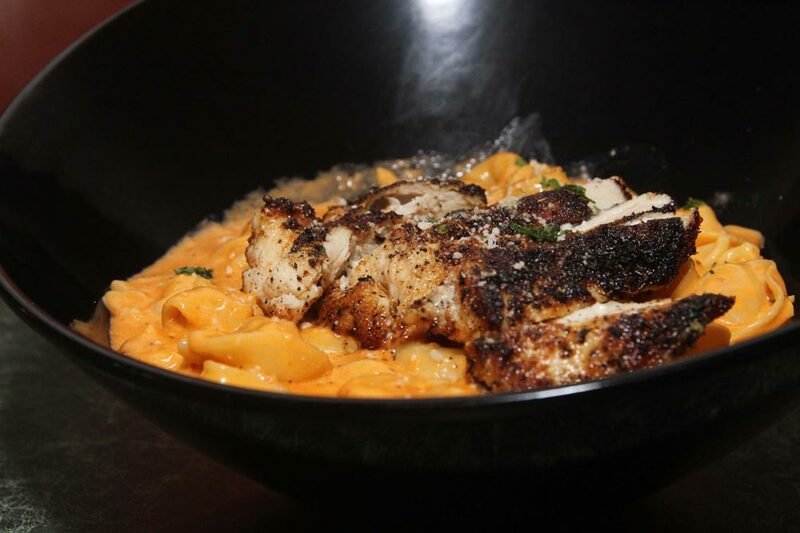 Chef recommended the addition of blackened chicken. This was the perfect combination as the blackened seasoning gave a burst of flavor to the creamy pasta. This dish had just enough spice to satisfy any palate. A solid offering. A steak then appeared, specifically, Donavito’s Fire Bleu Sirloin. This takes an Angus Reserve cut of sirloin that is flavored with charcoal seasoning. It is then cooked to order, topped with sauteed portabella mushrooms and served over the Fire Bleu sauce — a creamy bleu cheese sauce with a slight spice from an addition of hot sauce. The steak and mushrooms were cooked properly and the sauce was a nice addition. Lastly, a plate containing a slab of Donavito’s grilled St. Louis ribs was centered on the table. We couldn’t help but chuckle when we asked about the preparation of this dish and were told “you wouldn’t believe me if I told you, but I’m not going to tell you.” We were able to pry out of Chef Donatelli that the ribs are cooked for five hours in the oven. The ribs are then covered in house-made barbecue sauce (secret ingredients) and grilled for a nice char. The ribs were tender and falling off the bone. The sauce was sweet and flavorful. This would easily satisfy anyone’s craving for barbecue. Despite leaving Donavito’s with a few questions in our heads, our bellies were full and appetites sated. One thing that was very clear, Chef Donatelli is hard working and passionate about giving the community good food. But do us a favor when you stop by (and please do): if he asks you how you heard about the place, tell him it’s a secret. December 26, 2012 11:39 a.m.